This year you’re all getting an early post as I’ll be swanning around in Melbourne and soaking up as much of the tennis-filled vibe as I possibly can. I’m really looking forward to it. Not least of all because it will be the first time since forever that I’ll be watching two people that I’ve never met play a live game of tennis. 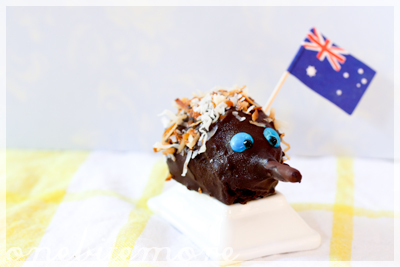 It’ll also be onebitemore’s second birthday on Australia Day (just my luck to share a birthday with a country…) so tune in to see a recap of some of my favourite edible moments of the past 365 or so days. I remember growing up in Sydney as a Chinese-Malaysian faced, Australian born kid. Together with our Aussie-born & bred neighbours, the Bean & I spent our afternoons riding BMX bikes up and down our cul-de-sac, trying to climb trees and catch cricket balls. And when our tummies started rumbling, we headed back home for tinned frankfurts with tomato sauce on toothpicks, or, even better, over to the Waugh’s place for biscuits, cake and cordial. It was there, I’m sure, that the Bean and I first discovered lamingtons. Tacky, slightly dry supermarket sponge sandwiched with luminescent red jam and whiter-than-white mock cream, a coating of sweetened cocoa patchily covered in dessicated coconut. 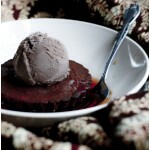 It was all of my dairy-disliking, coconut-loathing, cake-hating food fears come at once. But the Bean loved them. “Lamingtons! Lamingtons!” she would say, excitedly as we passed them in their plastic packaging at the supermarket. “Big lamingtons! No, little lamingtons!” she would answer when my mother asked what she would like for afternoon tea. 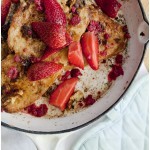 “Instead of lamingtons, an apple teacake maybe? 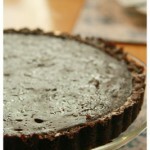 With the brown stuff on the white icing?” I would respond when my mother asked my opinion on the topic. “Noooooo!” the Bean would howl, as our mother silently vowed to do her shopping without us in tow. Fast-forward some years and I still haven’t quite acquired a taste for the quintessentially Australian treat. 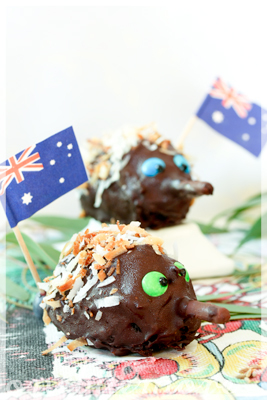 I have, however, acquired a taste for these dollied up happy echidna shaped cake balls – not least of all because they are just so darn cute! 1. 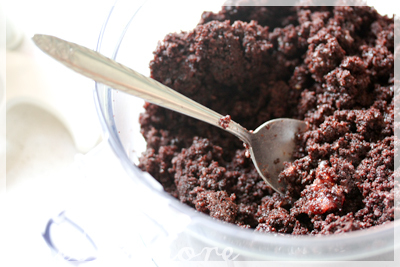 Break up the cake into chunks and pulverise it in a food processor or blender until it is well and truly crumbed. Stir through the cream and jam to make a sticky mixture. 2. Using damp hands, form the mixture into nine balls. Roll the balls between your hands to make them oval shaped, and then taper one end to form the nose or beak. 3. Press a broken pretzel stick into the nose to form the remainder of the beak. 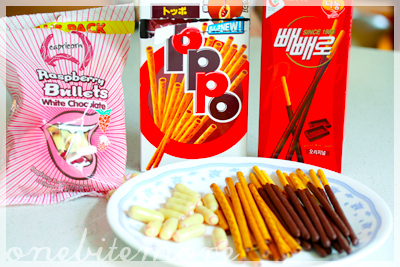 I used Peppero sticks for best results – other options include thicker chocolate filled sticks and raspberry or licorice bullets (these will have shorter, more blunt ends though and aren’t recommended). 4. 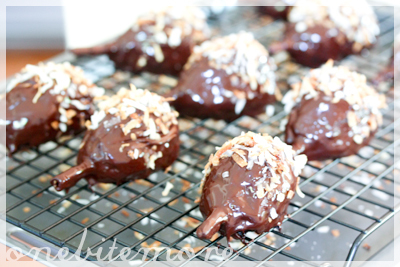 Melt the chocolate in a double boiler and coat the echidnas in the melted chocolate as best you can. 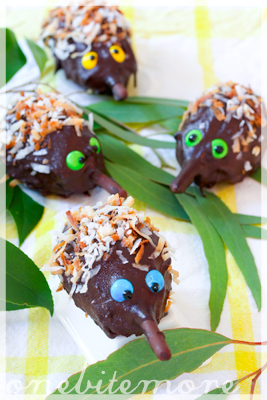 Drain the excess chocolate from the echidnas on a wire rack. 5. Toast the shredded coconut in a dry pan until it is fragrant and golden. 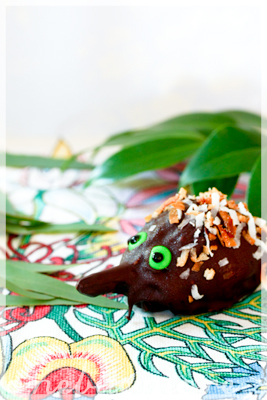 Sprinkle coconut on the back 2/3 of each echidna body. 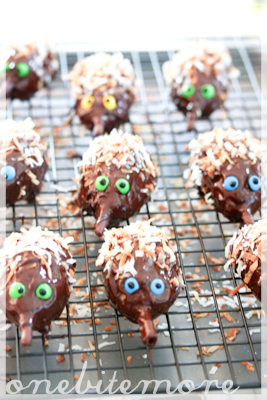 Add two eyes using mini chocolate buttons, and draw pupils on with black icing. 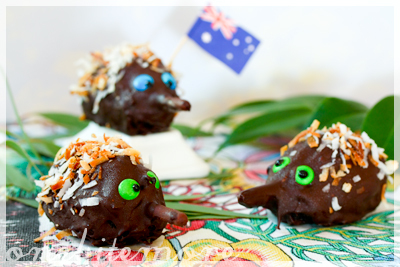 Shez how adorable are these echidnas. They are such a fascinating animals. Your dad is funny thinking they looked like rats. ehehehe. 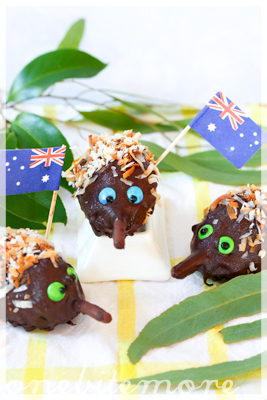 Have a fantastic Australia Day. Its going to be a hot one. lols your family is crazy. but awesome. but crazy 😀 hope you’re having a blast in melb! Oh, lamingtons! One of my first cake loves – surprising, considering I don’t really like coconut – but I would always go for the unfilled variety. Awwwww! 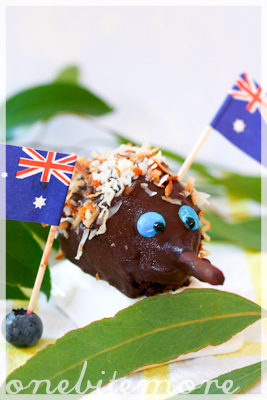 Being American I’ve never had Lamingtons but they sound excellent and the echidnas are great! not just rats, but fattened ones! the tail is definitely on the wrong end. hang on.. rats do not have spiky stuff on their body.. on well, never mind what i say, it tasted good. I love the eyes, and hehe to your dad’s comment about you putting them on the wrong end. They are just soooo cute. Awesome! 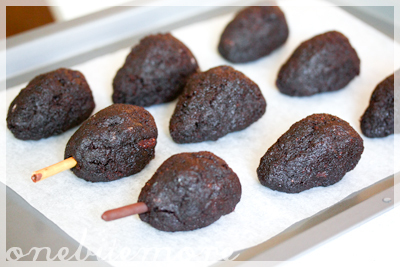 I tried cake pops once and probably not again. So much work – and not even prettily decorated like yours. 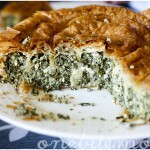 THANKS heaps for sharing your recipe!! Off to try it now.